By Captain C. L. Tebbutt, M.C., 1st Cambs. Res. of Off. T.A. The equipment of the infantry soldier is one of those matters which are liable to be shelved, owing to the cheerful way in which he fights, however irksome or unnecessary his burden may be; grumble of course he does, but regards the matter as inevitable; but nevertheless the problem is one of considerable importance, and should be reconsidered in the light of the experience of the war. The salient features of the war, regarded from this point of View, are two. Firstly, the infantryman, equipped at the commencement for a struggle in which rifle fire was thought to be the predominant factor, so as to allow the maximum comfort, consistent with the maximum mobility, was gradually loaded down with new articles, such as the "tin hat," the Lewis gun, its ammunition and its heavy drums, a leather jerkin, gas helmet, bombs, rifle bomb attachment, Very lights, flares, etc., while at the same time his physique, owing to lowered standards, conscription, and lack of training, deteriorated; with the result, inevitably, that his marching powers were very seriously decreased. My own experience was, that my company, when advancing in the open fighting at the end of the war, could not do more than 6 or 7 miles without being exhausted and unfit to attack. This fact was somewhat obscured in 1916-1918 owing to the stability of trench warfare, when marches were not long; and, when attacks were "made, "battle order" was substituted for "full marching order"; but it became immediately apparent when the German front broke up, and the soldier was expected to march and fight at short notice in "full marching order." Secondly, there appeared to be a lack of co-ordination between the demands of the troops, to meet new conditions, and the devices put forward by inventors to satisfy them. These devices, often extremely ingenious, suffered because the inventor was thinking of overcoming one difficulty rather than of the equipment as a whole. The result was that stores issued were often thought not to be worth the trouble of carrying, and were consigned to the quartermaster's stores, only to be brought out when the battalions were handing in equipment on demobilisation. This applied, moreover, to some articles issued before the war, such as the Barr and Stroud range-finders, which I believe some regiments carried for 4 1/2 years without using. The object of this paper is to suggest to those of an inventive mind some lines on which their research might run, and to suggest some actual alterations which might be made at once. The infantryman in 1914 was equipped for a war of movement, with rifle fire as the main weapon. In 1923 he must be equipped for a war in which he has to contend with heavy artillery fire, machine-gun fire, tanks, gas and aeroplanes, in addition to rifle fire. Let us consider the modifications in his equipment necessary to meet these new elements. Artillery.—The infantryman's protection against the heavy shell fire he must expect, apart from the additional support he expects from other arms, lies in (1) mobility, in a war of movement, and (2) capacity to entrench when he is halted. To attain mobility, efforts must be made to lighten his burden, and to improve the design so that it may be carried with less effort. Mobility is essential, for, however debatable may be the question of whether another war on a grand scale would be stationary or mobile, it is highly probable that in its initial and final stages, at any rate, it would be mobile. Moreover, such are the variety of the tasks and the terrain over which the army may be called to operate, that the infantry must always be fit to make long marches. Then he must be given a new entrenching tool. The present one is designed for scraping cover under rifle fire, and is utterly unsuited to modern conditions. If the soldier is under heavy machine-gun fire he will be wiped out long before he has got cover; if he is under shell fire only, he is unable to dig with it the type of trench that will give him security. This difficulty was recognised and overcome in 1917-1918 by equipping assaulting troops with the light G.S. shovel, carried between the pack and the back; but that is only a makeshift. What is wanted is a short shovel, similar to the German Infantry pattern, capable of being used for serious digging, and made as light as possible, perhaps utilising some of the new metal alloys made for airship fabric. When marching and fighting in October, 1918, my own men, on their own initiative, threw away the present tool and carried the German one, and then, when we had captured a village and were digging in under shell fire, the first thing we had to do was to search the houses for shovels for those who had been unable to "scrounge" the German shovels and were unable to make any impression with their own, and consequently suffered some casualties. Thirdly, there is the question of personal protection. 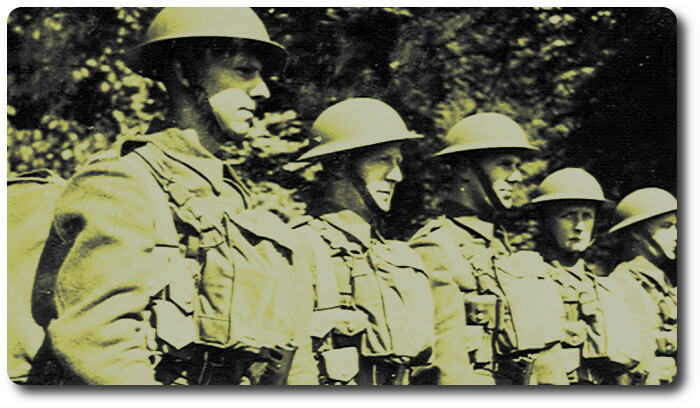 The steel helmet undoubtedly saved many lives, and ought to be retained, and, if possible, improved on the lines of strength, lightness, comfort, and, one might add, gracefulness; and the soldier's ordinary cap, which will in a campaign only be worn half the time, should be one that would not suffer in appearance by being tightly squashed in the pack (as does the present pattern), but something more comfortable, and one in which he could sleep—perhaps on the lines of the Glengarry, or the French and Belgian types. The protection of the body against splinters would also save many lives; the difficulty is again weight, but something might be done if a shield of a fabric sufficiently pliable to be worn for warmth, as a cardigan, could be produced; thus killing two birds with one stone. Machine-Gun Fire.—The infantry's weapons against machine-gun fire are its own rifle and Lewis-gun fire, rifle grenades, and, at close quarters, bombs. In all these, bearing in mind the general principle of mobility, lightness is essential. The Lewis Gun, for instance, is an excellent gun, but—it weighs 28 lbs., which is too much; especially with its ammunition and the dead weight of the drums. I believe that lighter drums, made of wood or fibre, to be used and thrown away, were issued towards the end of the war, but I never saw them myself. To return to the gun itself: lightness, rather than great rapidity of fire or accuracy at long ranges, should be the aim. Extreme rapidity is apt to lead to shortage of ammunition, and I venture to say that the average sight of the Lewis gunner in the war was about 400 yards. The special tasks which require these attributes can be performed by the Vickers-Maxims attached to brigade. The Madsen, I believe, is only 16 lbs. ; the Thompson (used by the rival armies in Ireland) lighter still; while the Italian army used an automatic pistol firing 300-400 rounds per minute, range up to 500 or 600 yards, but I do not know if it was found efficient. But it ought to be possible to get an automatic weapon, weighing 11-14 lbs, firing 350-450 per minute, accurate up to 1,000 yards, and reasonably simple in mechanism and reliable in action. (a) Heaviness of rifle bomb attachment. (c) Weight of the Mills bombs. (f) The obscuring of the rifle sights when attachment is fixed. As a result one usually found after an advance that either the attachment, or the bombs, or the special ammunition was missing. The French had a rifle grenade that used the ordinary cartridge, and that is a great step forward; but it requires a decrease in weight of the attachment and the bombs before it is a weapon which can be relied on for any fighting except the most carefully staged attack or well-established defence. As the rifle grenade is the only weapon which the platoon has which, when acting alone, will dislodge or silence automatic weapons under cover, the development of this weapon and the removal of these defects are of great importance. The hand grenade is, par excellence, the trench weapon, and, as such, the need for lightness is not so great; as trench warfare, with its greater organisation and stability, will allow of the supplies of bombs, even if heavier than absolutely necessary. But as, in these bomb fights, moral effect plays a great part, any tendency to decrease weight and increase range, even at the sacrifice of some destructive efficiency, would be an improvement. Anyone who has fought with Mills (range 30 yards) against the German egg bombs (range 50 yards) would, I think, endorse this. Tanks.—In the defence against tanks lies the infantry's greatest weakness, and in view of the vastly increased potentialities of tanks this problem must be most carefully considered. The only reply to the tank from the infantry at present, is the German anti-tank rifle—a heavy, clumsy weapon, which may be already obsolete, owing to improvements in tanks' armour. There seem to me only two lines on which anti-tank defence can be arranged. One is by the use of the rifle grenade in some special form, such as a special grenade two or three times as heavy as the ordinary bomb. It would have the disadvantage of decreasing mobility, owing to weight, and of very short range, for the same reason, and it would be a difficult weapon to hit with, because of its high trajectory. The other solution lies in the adoption of a company gun—something quite light, pulled perhaps by dogs, and its ammunition by a mule, and collapsible, so that its crew could carry it into action should circumstances necessitate it; with a shell of 2-3 lbs., and a range of 500-700 yards. The gun would have to be restricted to use against actual tank attacks, or else its comparatively small supply of shell would be frittered away on targets not vital. Guns answering in some respects to these specifications were used in the French and American armies. Aeroplanes.—Here the infantry's defence is, as with shell fire, mobility, skill in taking cover, and efficiency in digging in. The automatic weapon would, of course, require a special anti-aircraft sight, as was issued to Lewis-gun teams. Gas.—Protection against gas is too technical a matter for this paper. Designers of masks should keep the watchword of lightness before them. In addition, arrangements should be made for attaching the mask to the equipment as an integral part, so as to avoid the haphazard methods of carrying it which had perforce to be adopted during the war. So far I have dealt with specific dangers and the modifications which they entail. The moral of the argument is as follows: modern warfare requires that the foot soldier shall carry additional equipment. He was previously equipped as heavily as was consistent with maximum mobility. If we are to maintain maximum mobility with the increased burden, these facts become apparent: (1) the new load must be as light as possible; (2) the new equipment must be rearranged so as to render it easier to carry; (3) other portions of the equipment must be cut down. I believe that if all three were done, as I shall indicate, the soldier could not only retain his maximum mobility, but he could carry additional kit without sacrificing marching power. First as to cutting down of portions of the equipment: there is nothing sensational that can be done, as every article is a necessity; but there should be a most careful economy of weight in every one of them. The rifle, bayonet and scabbard might, by the use of new metal alloys and reduction in the wooden parts, be lightened by a pound or two. The whole equipment is, in my opinion, rather too well made; a little strength in the buckles, belts and straps might be sacrificed. 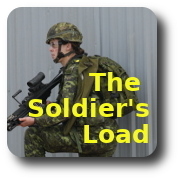 The overcoat is at present one of the heaviest items of the soldier's load. It might be reduced in length towards the design of the British warm (this was foreshadowed by the device whereby the last 6 inches of the regulation overcoat could be turned up and fastened inside by buttons, for use in trenches), and might be made of one of the many materials used for trench coats, which, while in no degree less warm, are considerably less heavy than the regulation cloth. In view of the relatively less importance of the rifle in action, the number of rounds might be reduced to 100, with the saving of four pouches. The metal used for the water bottle and mess tin might be lighter, and the leather entrenching-tool guard done away with altogether. All these things are small in themselves, but in total might save several pounds. Then as to better design. The present webbing equipment, though quite practical and efficient, and far in advance of the awful, unconnected conglomeration of straps, buckles and pouches which preceded it, is by no means the last word in scientific weight distribution. The Norwegian Bergan pack is worthy of examination in this respect. Invented some 13 years ago, on new principles, it is now universally used in that country for ski-ing and climbing, has been adopted by the Norwegian army, and was employed by the Mount Everest expedition. After giving it a trial I came to the conclusion that it enabled an increase of 30 per cent. in the weight of the pack without any greater discomfort being experienced. It is the logical application of the principle that the right place to carry weight is on the hips and not on the shoulders—a principle recognised in the webbing equipment, in the instructions, when assembling, to keep the straps fastening the pack to the belt tight, and to allow the pack merely to be held on to the shoulders by the shoulder straps. It is carried farther in the American equipment, with its pack of great length reaching right down to the crest of the hips. In the Bergan the whole weight is taken on the hips by a metal framework half encircling the body. The centre of gravity of the body is an inch or two above and out from the crest of the hips, and the whole weight being concentrated there can be supported with less alteration to the equilibrium, and thus less fatigue. The metal framework holds the pack rigid to the body when running; and the width of the pack at the bottom, rather more than the width of the whole back, gives a much greater space for carrying kit. The metal framework holds the pack away from the body, allowing a free current of air between it and the back, which is more healthy and, comfortable. I have only seen pictures of this pack as adapted to military use, but examination of the one in my possession shows it could be easily done. If I am right in thinking that with the above alterations the soldier's equipment could be added to, then there is the interesting question as to what form it might take. I fancy, so many minds, so many different opinions. Personally, I should like a spare pair of boots (as in French army) of a lighter type, so that a rest could be given to the feet at the end of long marches; and, secondly, light canes for the construction of bivouac tents (as in the German). One word more: the study of the infantry soldier's equipment should include the study of the infantry officer's equipment. In open warfare he will be as dependent as the private for comfort on what he can personally carry; and a properly designed equipment, based on the same principles as that of the private, but modified to meet his especial needs as to field glasses, revolver, and compass, should be designed and be made compulsory. Many might grumble at first, but after experiencing the comfort of a well-thought-out equipment, as compared with the ill-balanced and roughly put together hybrid of the officer's leather field-glass and compass case, ammunition pouch and revolver holster, on top of the ordinary webbing equipment, as worn by most infantry Officers in the field during the war, grumbling would give place to gratitude. I am, unfortunately, only too well aware that any changes in equipment are likely to be barred on the ground of economy; all that can be done is to wait, and hope for better days, and in the meanwhile search for the best that can be found. The British army is necessarily small, but, because of that, it should embody, in all its details, the most efficient and practical methods and ideas.